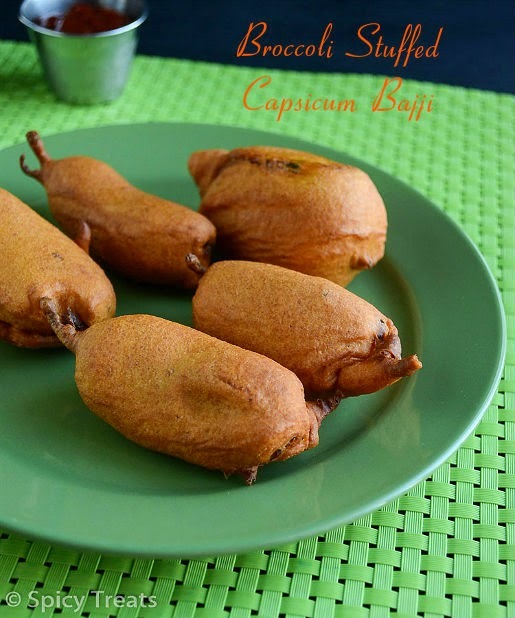 Stuffed Bajjis are my favorite, i could not resist eating the hot and spicy mirchi stuffed bajji. Mirchi Bajji and Bombay Appalam/papad is one must item that i never fail to enjoy in Exhibition. Every year we visit Exhibition mainly for this 2 snack items. I miss all those fun here. Mirchi bajji/Pakora available here in most of the Indian restaurants but i miss the typical Exhibition Stall's taste and flavor. 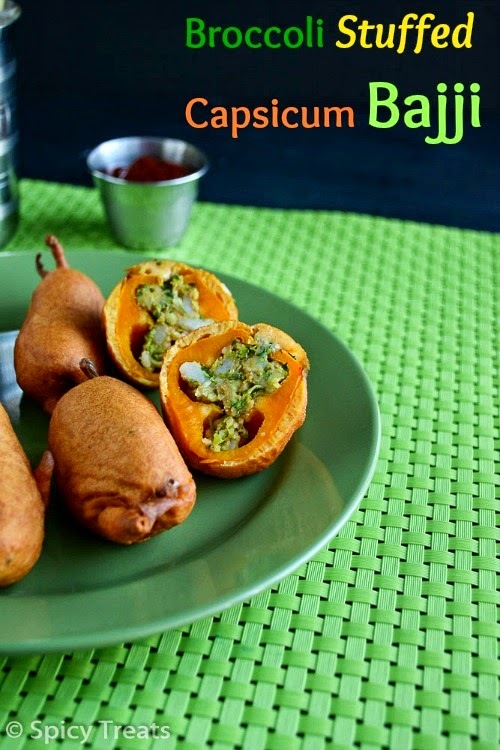 I have already shared Plain Mirchi Bajji / Banana pepper Fritters but because of its spiciness my kids do not like it. So this time i used Mini colored Peppers with Broccoli Potato stuffing. They turned out so good and we enjoyed for our tea time snack. You can use any desired stuffing and any desired pepper - banana pepper, long spicy chilli, capsicum etc. Serves : 12 mini stuffed fritters. Wash mini peppers and pat dry with paper towel and keep it in a plate. Then In a bowl, add shredded broccoli, mashed potato, finely chopped onion, ginger, cumin powder, chilli powder and salt to taste, then mix everything well and keep aside. In another bowl add all the ingredients for bajji batter and mix well, then add water little by little and make it to a smooth medium thin batter using water. Now take one mini pepper and make vertical slit and fill it with broccoli-potato stuffing. Stuff all the mini peppers and keep ready. After that heat oil in a kadai to deep fry, when it is hot, take one stuffed pepper and dip it carefully in the bajji batter and drop it in the hot oil. Deep fry in medium heat, rotate the bajji while frying and fry until the bajji turns mild crisp and golden brown on all sides. And remove the bajji using slotted spatula/ladle and drain it in paper towel. Repeat the same process for remaining batter and stuffed peppers. 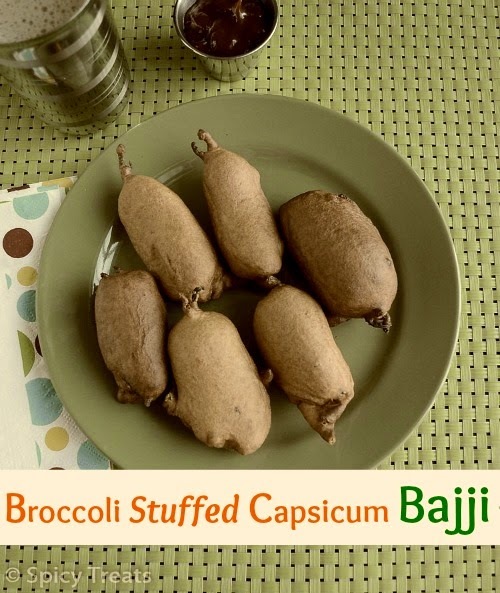 Serve the Broccoli stuffed bajjis hot with some ketchup or coconut chutney. You can also blanch the broccoli florets then drain and pulse it in a processor and use it in the recipe. Instead of mini peppers you can also use banana pepper or any any desired pepper variety. 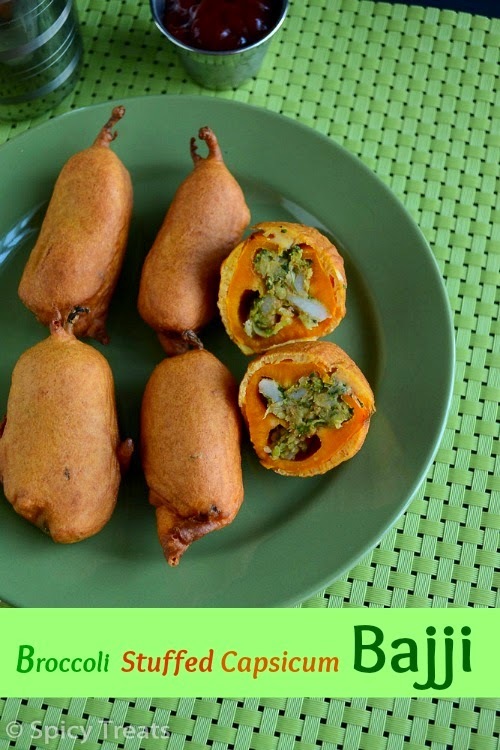 With the same broccoli-potato stuffing instead of bajji you can also make Bonda using the same bajji batter. Either way tastes great! If your bajji batter is too thin then capsicum will not be coated properly and when u drop in oil it drinks more oil and soggy. See the step wise last pic, when u dip the batter should be coated fully with capsicum, so adjust the consistency accordingly. If the batter is too thick, then the bajji will be thick and will not turn crispy. How many mini peppers are required? You haven't mentioned in the ingredients..
How many mini peppers r required? U haven't mentioned it in the ingredients. Yummy Bhajis, great as a eve snack. Good luck with your cooking challenge! Wow new kind of bajji! Wow, those mini pepper bajjis are asking me to have some, damn delicious Sangee. Very creative Sangee, the bajjis look awesome..